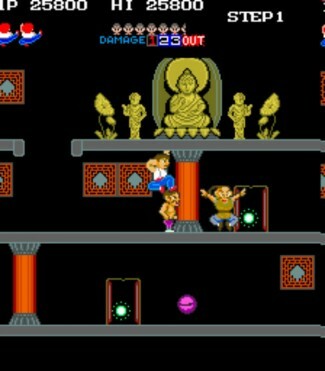 Kung-fu player jumps around multiple level boards, kicking opponents and collecting power-ups and bonus items. Player defeats by way of three kicks the board “boss” and advances to the next level. Player kicks opponents off screen to advance to the next level. The kick button is used to kick enemies, and the jump button is used to jump over projectiles and to perform jumping attacks. To jump to another level, press up or down with the control pad without pressing any buttons. This is a common mistake players make when trying to escape enemy attacks. Ordinary enemies include an enemy with purple shorts, and an enemy with green shorts. When an enemy with green shorts is defeated, a ball appears. Catching a ball enables special abilities. The purple ball gives the player a boomerang hammer. Pressing the kick button throws the hammer in the direction the player is facing and pressing the joystick in the opposite direction returns it. The yellow ball gives the player a blow gun. Pressing the kick button fires projectiles in opposite directions. The green ball circles the player, making him temporarily impervious to enemy attack. All balls last for approximately five seconds. Each level consists of two rounds – ordinary enemies, and super enemy. The super enemy can be destroyed with four blows. There are four levels of two rounds each. The first super enemy is a character with a tail on the back of his head who crosses his legs and stretches out his arms every time he jumps. The second super enemy is a lady who throws punches and kicks and whose dress goes out just before she jumps. The third super enemy has a white mane and spits fire. The fourth super enemy is a fat character that also spits fire. The best way to defeat these enemies is to wait on a level above or below them, move to the side just as they initiate their jump, and kick them while they are still in the air. This also works well with ordinary enemies. On the first level, ordinary enemies attack by using jump kicks, jumping up/down levels, and throwing daggers. Beginning with the second level, ordinary enemies can fly directly at the player. Players can be hurt by 1 being attacked by enemy characters, 2 being hit by an enemy projectile, or 3 falling off a platform. A player can only sustain four hits before dying. Each time the player is hit, a number appears above his head indicating which hit the player has taken. On the third hit, the player starts flashing, indicating that he can only take one more hit before dying. A damage meter is located at the top of the screen. When a player completes a level by defeating the final enemy, a slamming noise is made while the character flexes his muscles and says “GUTS!” If a player finishes a level without flashing, he/she receives a bonus. After all four levels are completed, play returns to the first level, but the enemies are more difficult to defeat.